George Washington expanded and improved Mount Vernon throughout his life. Explore each of the twenty-one beautifully interpreted rooms throughout the Mansion's three floors. The first floor contains the more formal parts of the Mansion, including the dining rooms, parlors, central hall, and Washington's study. Opting for vivid paint and wallpaper through much of the house, Washington made choices that expressed the tastes of his era, when the use of bold colors was a sign of wealth. The stunning green of the wallpaper in this room was one of his favorites. The furnishings include various original Washington pieces as well as period pieces similar to those the Washingtons would have owned. Washington ordered the Federal-style sideboard (on the river side of the room) and several of the side chairs from Philadelphia cabinetmaker John Aitken near the end of his presidency. Like the grand “salons” of fashionable 18th-century English manor homes, this room was meant to serve several functions. As a receiving area for visitors, its high ceiling, large volume, and symmetrical decoration made the space truly impressive as the room alone was larger than most houses in colonial Virginia. As well as its scale, the New Room’s large north-facing window made it an ideal picture-gallery. Washington hung 21 works of art in the room; the six large landscape paintings currently on display are the original canvases that Washington acquired. Finally, the room was used occasionally for dining, likely for guests of high rank or large parties that could not be accommodated in the smaller dining room. The New Room’s high ceilings and two exterior doors also provided much-needed cross-ventilation when the Washingtons entertained during the warm summer months. Before the New Room was completed, Washington considered the front parlor to be “the best place in my House." 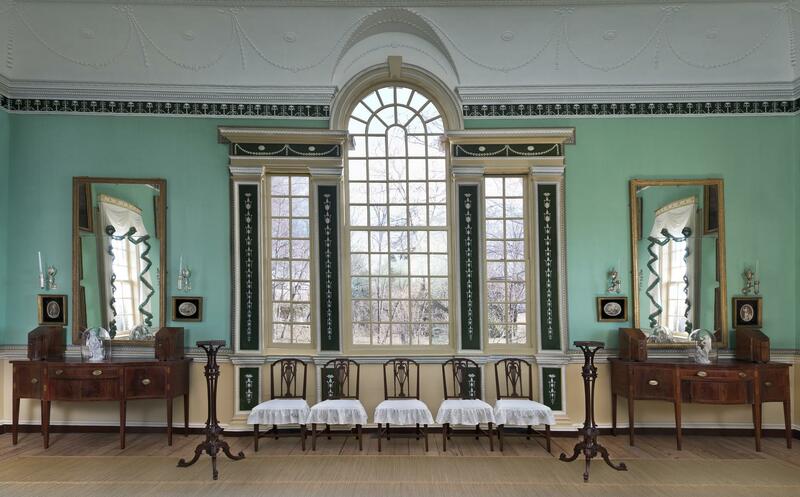 This elegant room was a public space where visitors enjoyed the Washington family's company. Tea and coffee were customarily served here during the winter and on rainy days, and the household gathered here in the evenings to read, discuss the latest political news, and play games. The architectural elements, including the mantel, two Palladian door frames, and paneled walls. These features make the front parlor one of the finest surviving examples of colonial Virginia architecture. Reminders of the Washingtons are evident throughout the room, from the family portraits adorning the walls to the family coat-of-arms above the carved mantel and the crest on the decorative cast-iron fireback. 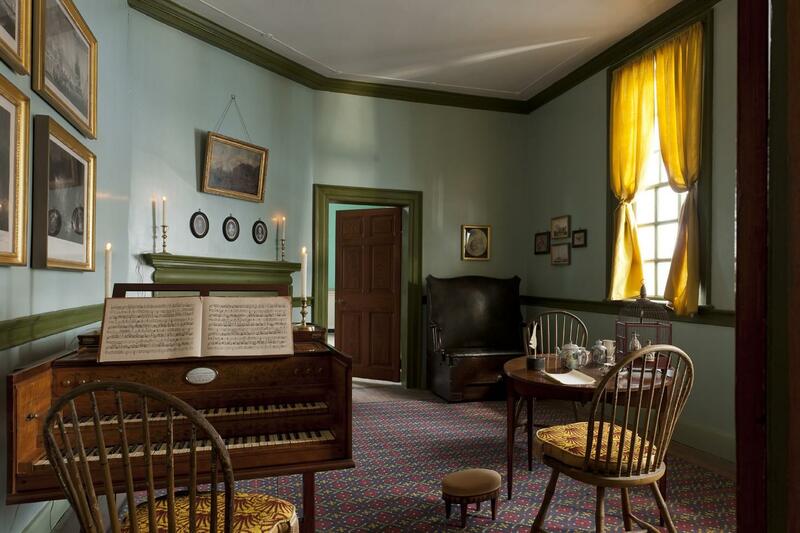 When George and Martha Washington returned home from the presidency, they decided to convert what had been a first-floor bedchamber into a family parlor and music, thus allowing more space for informal entertaining. 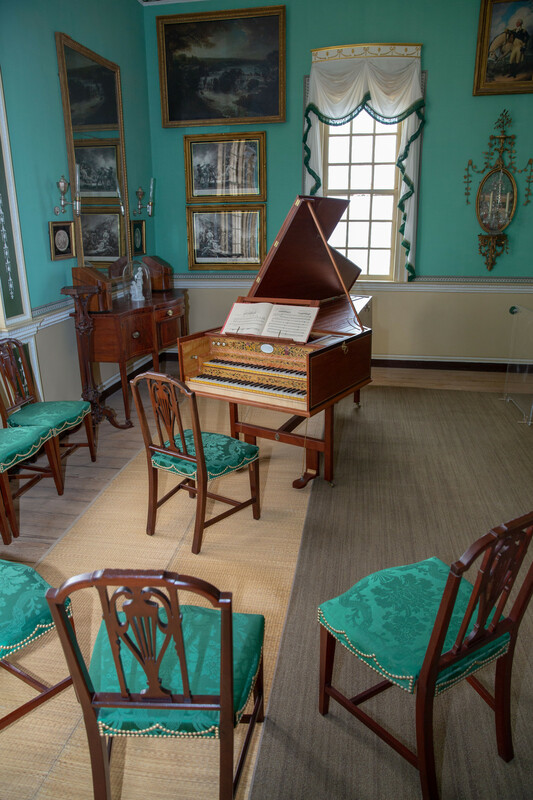 Music played an important role in the Mount Vernon household, as it did in other genteel Virginia homes of the period. Music masters traveled from plantation to plantation, instructing the young, and their presence often inspired lively social gatherings filled with music and dancing. Washington loved to dance, and he is reported on one occasion during the Revolutionary War to have done so for three hours. Though by Washington's own account he could neither sing nor “raise a single note on any instrument," he helped ensure that his stepchildren and step-grandchildren were instructed in music. Early in his marriage, he ordered a spinet for Martha's daughter, Martha (Patsy) Parke Custis, and a violin and German flute for Martha's son, John (Jacky) Parke Custis. The central passage is the entryway into the Washingtons' home, the place where visitors who came by carriage through the west front drive were greeted. Entertaining also occurred in the central passage, particularly during hot Virginia summers when the family gathered here to enjoy breezes from the open doorways. 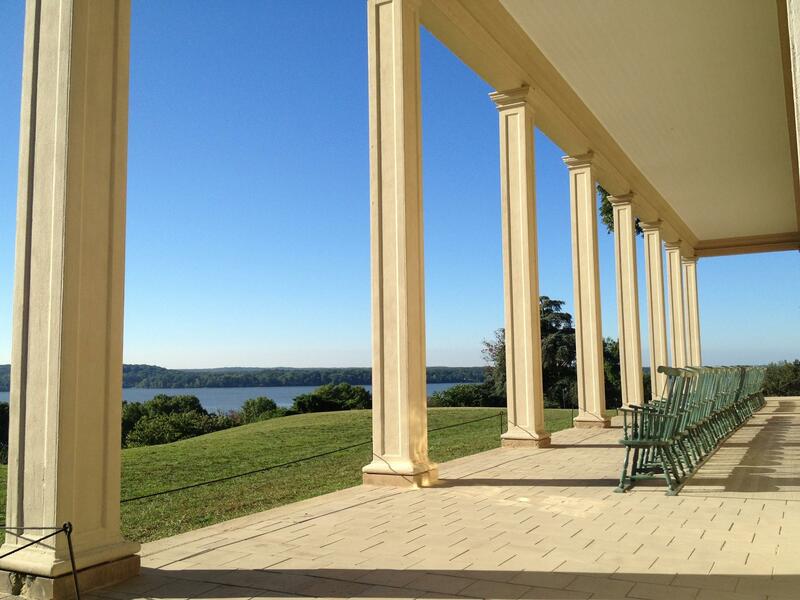 The elegant space, which runs the width of the house, provides magnificent views of the Potomac and the Maryland shoreline to the east and of the pastoral bowling green, fields, and woods beyond to the west. 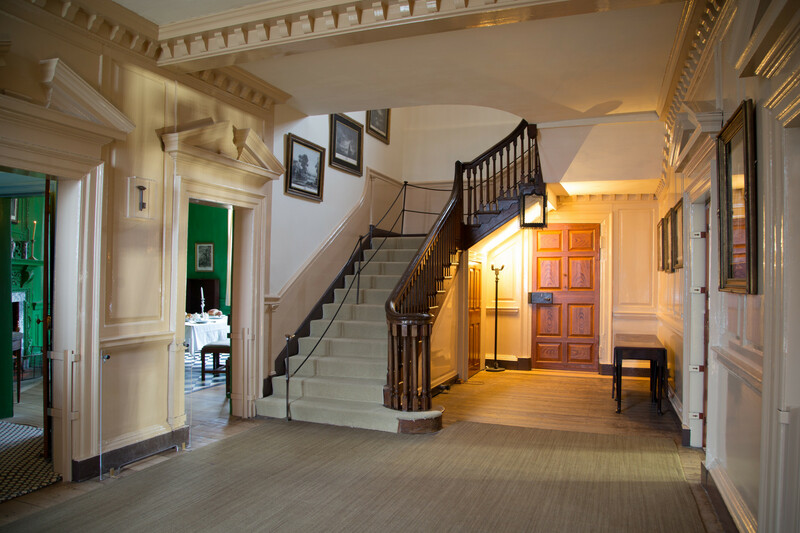 When George Washington first enlarged the house, in 1758 and 1759, he added the native black walnut staircase to the central passage. Being prudent and practical, he moved the earlier staircase to provide access to the newly constructed third floor. In this central hall you will find the Key to the Bastille, given to Washington by the Marquis de Lafayette in 1790, after the destruction of this infamous prison in Paris. 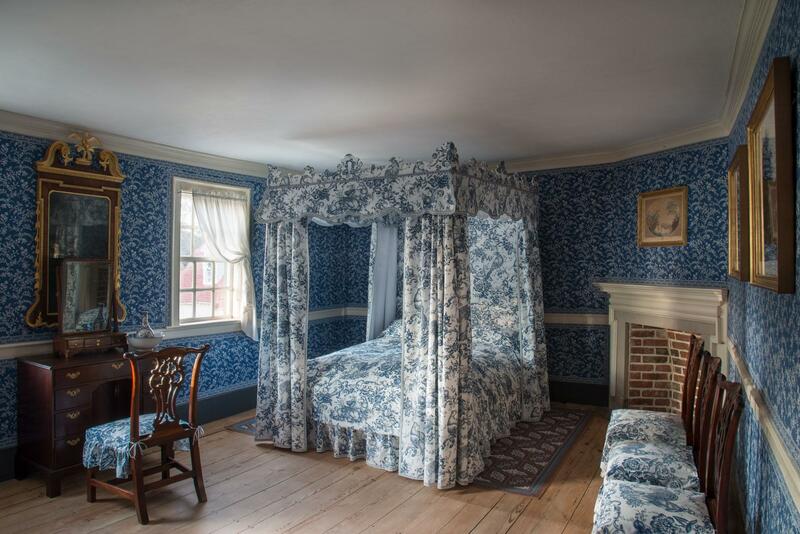 This bedchamber accommodated some of the many visitors who stopped at Mount Vernon before, and especially after, George Washington's presidency. He once described the house as a “well resorted tavern" because “scarcely any strangers who are going from north to south, or from south to north do not spend a day or two at it." According to his diaries, overnight visitors were present in his home about two-thirds of the time, arriving at a household that was already sizable. In December 1799, it included six people: the Washingtons; Mrs. Washington's youngest grandchildren, Washy and Nelly Custis; Washington's nephew Lawrence Lewis, who had married Nelly in February of that year; and the Lewises' newborn daughter, Frances. 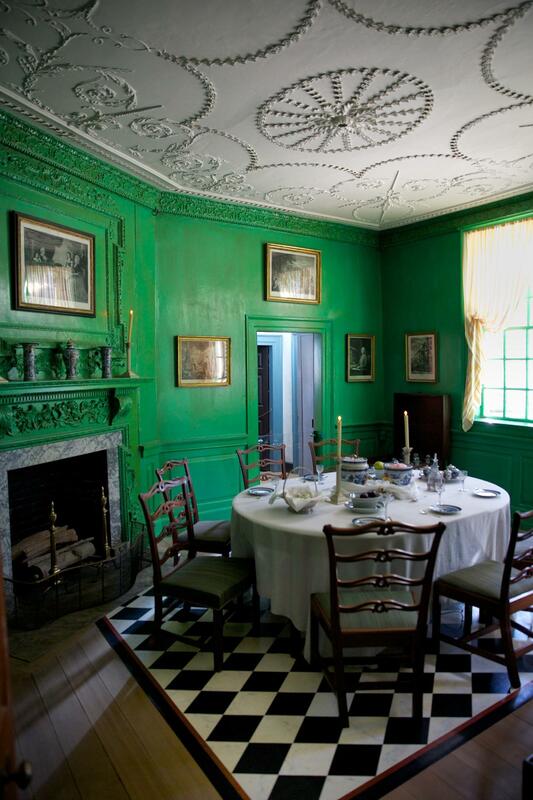 One of the most striking spaces in the Mansion, the dining room is part of the original house, built in 1734. Over the years, the room underwent a series of renovations. While Washington was away commanding the Continental Army in 1775, it was updated under the supervision of his cousin Lund Washington. In 1785 striking verdigris-green paint was added. 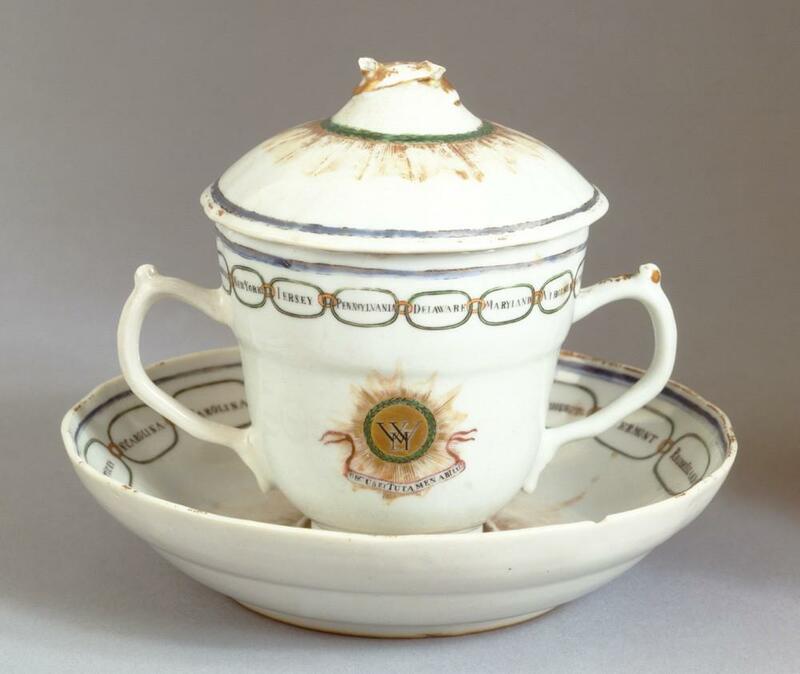 Washington believed the color to be “grateful to the eye" and less likely than other colors to fade; an overcoat of glaze further intensified the color. In 1775 Washington decided to install an elaborately decorated plaster ceiling and add plaster ornaments above the fireplace. He hired an expert plasterer, identified simply as the “Stucco Man," who spent five months completing the hand-tooled ceiling. A renovation in 2001 uncovered some of his original pencil drawings on the ceiling laying out the design. 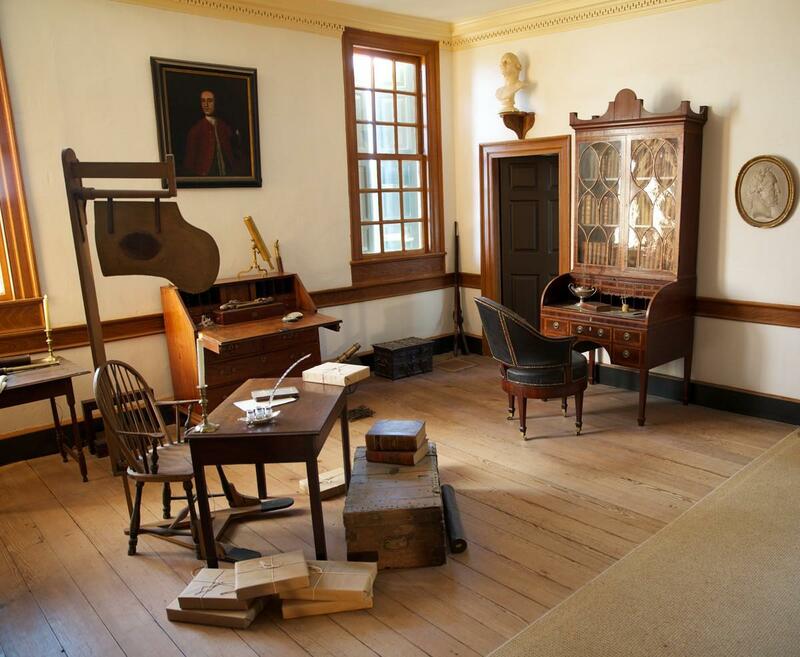 After George Washington's return to Mount Vernon at the end of the Revolutionary War in 1783, the study became his retreat from ever-present family and visitors; a place where he could quietly and privately tend to business. Reportedly, no one was allowed in this room without his invitation. From here, he directed the management of his estate, receiving reports from overseers, making daily diary entries, and posting his accounts. 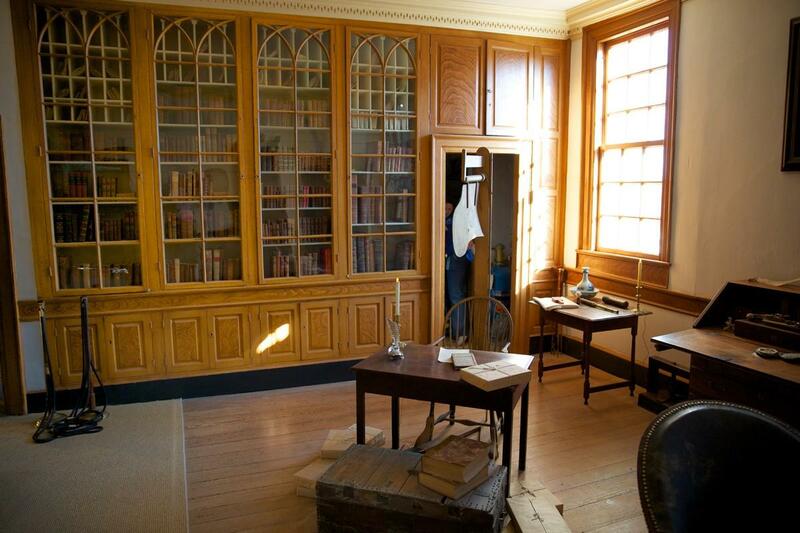 The study was also where Washington bathed, dressed, and kept his clothes. Each morning, he rose between 4 and 5 a.m. and went to the study, using the private staircase that led down from the bedchamber. According to the recollections of his step-grandson George Washington (Washy) Parke Custis, he lit his own fire and dressed himself. Washington used this quiet time to write letters or review reports until breakfast at 7 a.m., after which he usually rode out to his farms. In the evening, unless he had a social obligation or lingered talking to visitors after dinner, he returned here to read or confer with his secretary until around 9 p.m., when he went to bed. 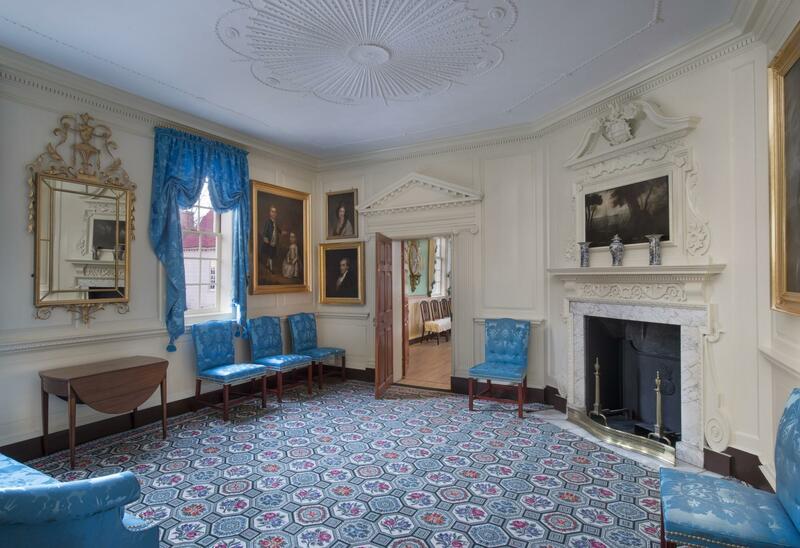 In this room you will find a fan chair similar to Washington's, which helped him to stay cool on hot summer's days; Washington's chair that he used as President, a portrait of Lawrence Washington, bookcases, a secretary, and other artifacts from Washington's life. Everyday Chinese porcelain dishes were stored in this small space. Finer china was stored in a closet on the third floor. Evidence of the wiring for the house bell system can still be seen across the ceilings of the pantry and back hall. The bells summoned servants and enslaved individuals to the dining rooms, piazza, and one of the bedrooms. The two-story piazza is the Mansion's most distinctive architectural feature. Extending the full length of the back of the house, it also has a practical function—catching the river breezes on a hot and humid Virginia day. The Washingtons treated the piazza as an outdoor room, serving afternoon tea here to visitors and family members seated in simple Windsor chairs. From the piazza, visitors observe a wooded area, which was an 18-acre deer park. This was a common feature on large estates of the time. Washington stocked his with tame deer from nearby and from England for the delight of family and visitors. The trees between the Mansion and the river were carefully pruned to emphasize the view of the Potomac, creating a so-called "hanging wood." In 1754, George Washington began residing at Mount Vernon, a 3,000 acre estate and a house that likely approximated 3,500 square feet. By his death, Washington’s Mount Vernon consisted of about 7,600 acres and an almost 11,000 square foot mansion. The second floor includes six bedrooms, including the Washingtons' personal bedroom. 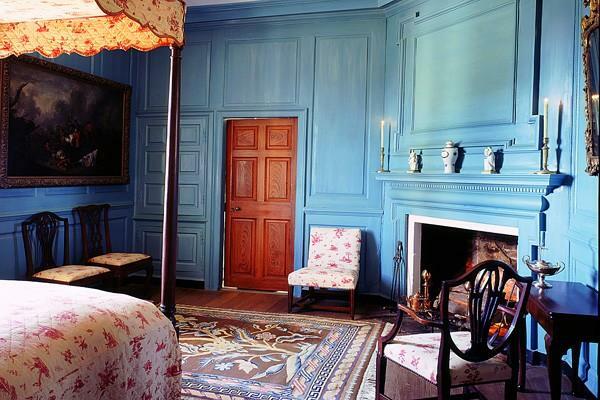 The Blue Room was one of the six primary bedchambers at Mount Vernon. Located at the top of the stairs on the second floor, the Blue Room overlooked the front entrance and the view to the west. By the late 1790s, it served as a bedchamber for visiting family and guests. Architectural moldings and a mantel, painted cream in the 1790s, framed the space, while blue textiles and wallpaper distinguished it. A unique mix of furnishings acquired over the course of the Washingtons’ lifetimes offered comfortable accommodations and an innovative Rumford firebox provided a warmer, smoke-free stay during the cooler seasons of the year. 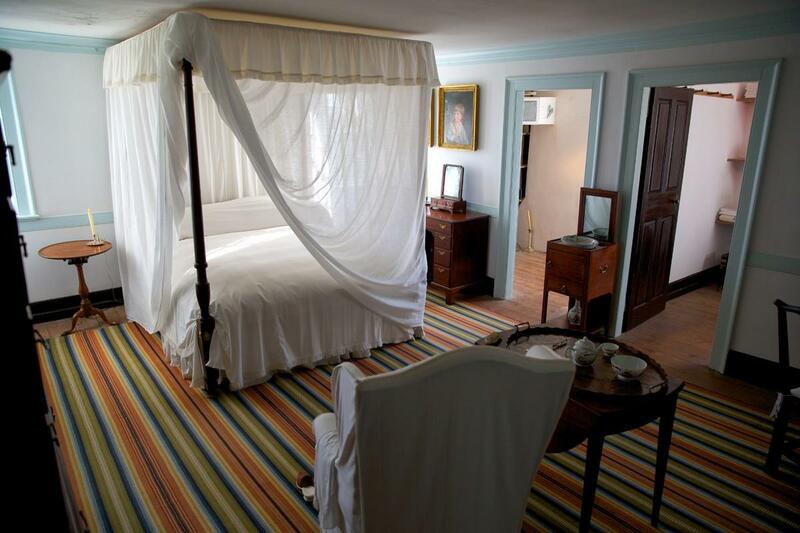 This room is often referred to as the Lafayette bedchamber because it is believed that the marquis stayed here while visiting the Washingtons. Lafayette was a young French nobleman who volunteered his services in America's fight for freedom. Like his beloved Washington, he served without pay as a general in the Continental Army, and the two maintained a strong bond. There is always a period likeness of Lafayette on display within this room. In a 1784 letter to the marquis, George Washington wrote, “It is unnecessary, I persuade myself to repeat to you my Dear Marqs. the sincerity of my regards and friendship, nor have I words which could express my affection for you, were I to attempt it." Prior to Washington's expansion of the Mansion to a full two stories in the late 1750s, this room was part of a larger room. In Lawrence Washington's 1753 probate inventory this single room was called the room at the "Head of Stairs." The volume of the room at the head of the stairs was originally substantially smaller because the lower roof of Lawrence's house made this room an attic room with a knee wall and sloping ceiling. Despite the smaller size, in 1753, the room housed two bedsteads, although it is not known if they were assembled or merely stored here. 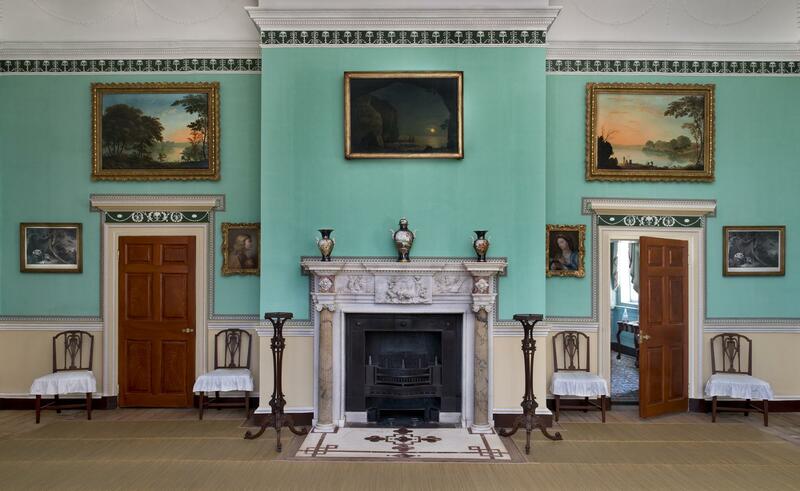 The hall bedchamber created by the 1757-59 work was described as "a Closet with the Window," while the garret stair occupied a space "6 feet by 12 off from the old Store room." 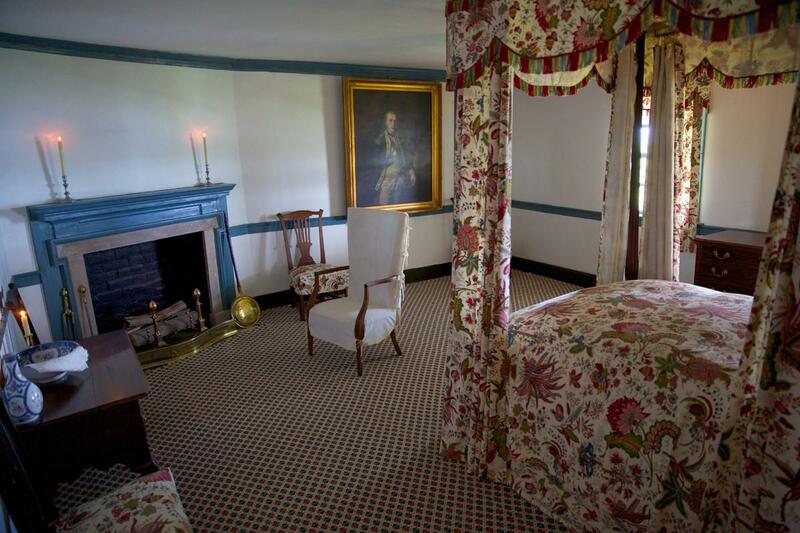 During George and Martha Washington’s lifetimes, the Chintz Room was one of the most richly furnished bedchambers in the house. 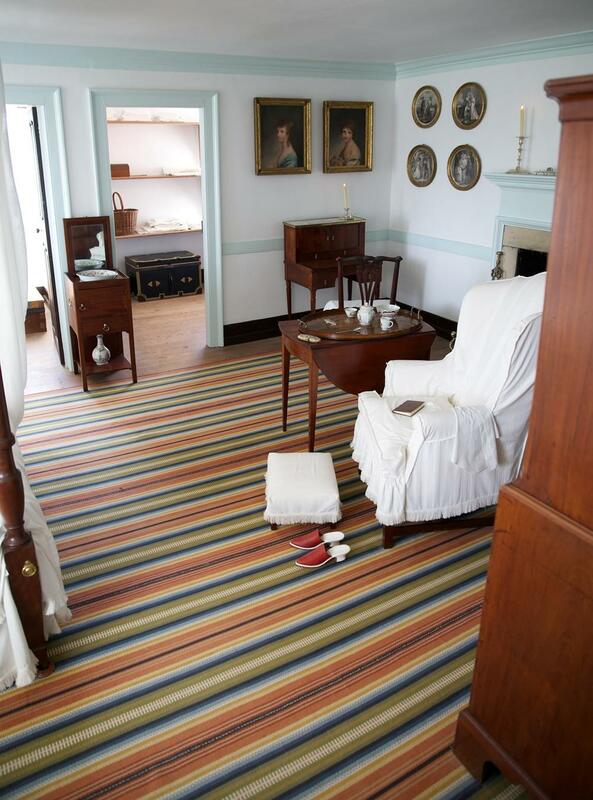 This room was used by Martha Washington's granddaughter Nelly Custis, who lived at Mount Vernon from early childhood. The room dates to the 1758–59 enlargement of the house. Mount Vernon’s curatorial staff discovered that the bedhangings were most likely those purchased by Washington in Philadelphia in 1774, made by none other than Betsy Ross! Nelly married General Washington's nephew Lawrence Lewis at Mount Vernon on February 22, 1799 — the president's last birthday. The couple lived at Mount Vernon until construction of their home, Woodlawn Plantation, three miles away, was completed. 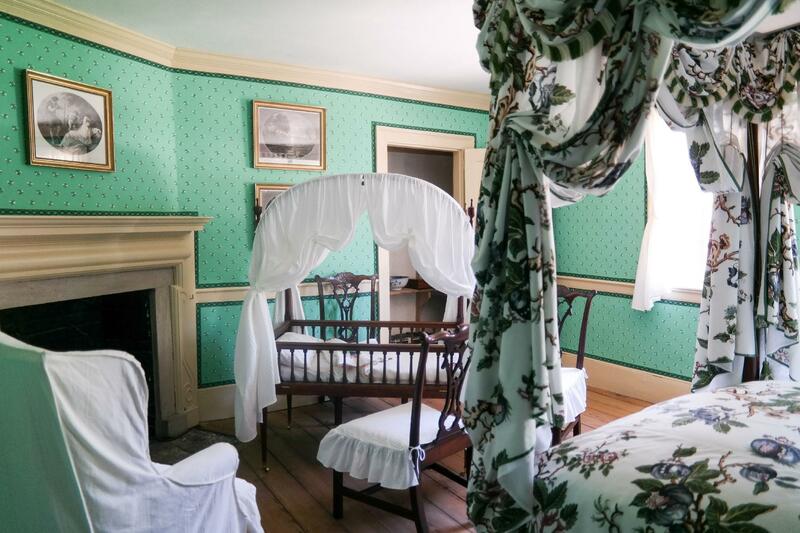 Their first child, Frances, was born in this room only days before Washington's death in December 1799. Nelly remained confined to her bed and was unable to attend her step-grandfather's funeral. 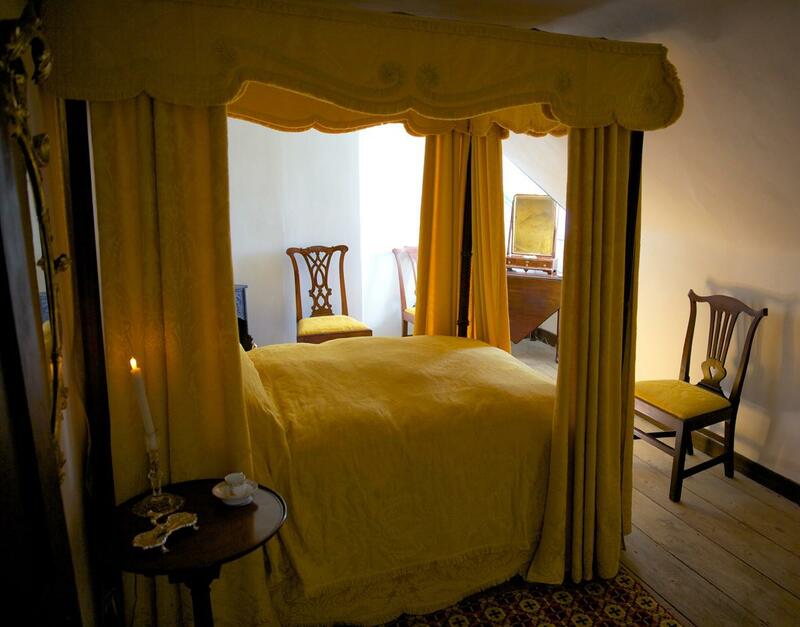 The yellow room occupies the southeast corner of George Washington's 1759 house and is slightly larger than the first floor bedchamber that is below it. Before the remodeling of the 1750s, this space formed two rooms, one unheated and tucked under the east slope of the roof, and one heated called the "Yellow Room." With the creation of the full second story, the new Yellow Bedchamber received a corner fireplace and a window in the east wall; there may also have been a window in the south wall, or a door leading to the roof of the one-story south closet. The current mantel was installed in 1775 when the south addition to the house was added. 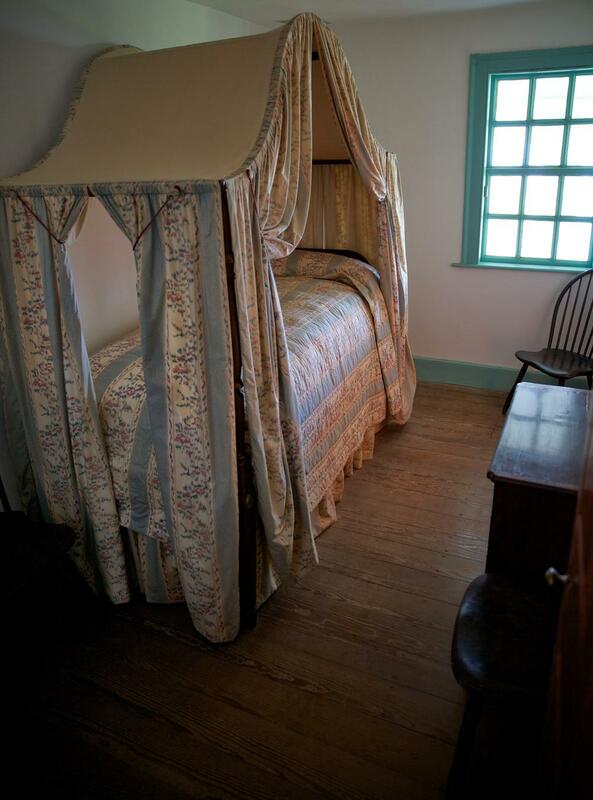 Located directly above the study in the private south wing was George and Martha Washington's spacious bedroom. Designed according to Mrs. Washington's suggestion that it be simple and functional, the room was also her sanctuary, where she planned her schedule and wrote letters to friends and family members. According to her grandson, she also spent an hour there each day reading the Bible and praying. Washington died of a severe throat infection in this room on December 14, 1799. Upon his death, Martha closed the room and, for the remaining several years of her life, spent much of her time in a bedchamber on the third floor. 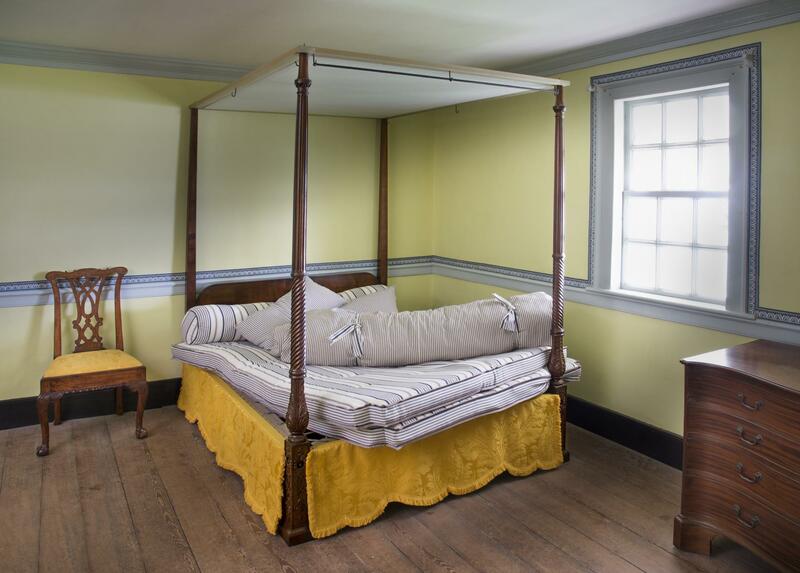 Purchased in the early 1790s, the bed was described by Mrs. Washington as “the new bedstead which I caused to be made in Philadelphia." Its design is in keeping with the Washingtons' preference for elegant simplicity. At just over six feet, six inches long, it was large enough to accommodate the General, who stood about six feet, two inches tall. In this room you will also find a mantel clock from Washington's presidency and a fine French writing desk crafted of mahogany with a marble top and brass fittings. The third floor includes a number of rooms that were used for storage and living space, and provides access to the cupola. The four garret chambers were created by the remodeling work of the late 1750s. The rooms all changed slightly after the north and south extensions were completed in the 1770s. In their initial configuration none of these rooms had a fireplace, being heated solely by radiant heat from the chimneys of when fires burned in the rooms below. A small fireplace was added to the northeast chamber in 1776. In 1797, Washington drew a plan indicating that he intended to install a stove in the southeast chamber, but this stove was instead added to its neighbor to the west, which Mrs. Washington occupied after her husband's death in 1799. These two storerooms are located in the north and south additions made to the house in the mid 1770s. Tradition held that Martha Washington occupied the south lumber room after George's death, however, the 1799 inventory indicates that Mrs. Washington's room was heated by a stove, and architectural investigations clearly show that this room never had a stove. The only room to have had one is the room now identified as her bedchamber. The current size and shape of the china closet was created by the addition of the 35'-10.5" wide pediment in 1778, but paint analysis of the paint on the inside face of the door trim indicates that there was a room in this location dating to the raising of the roof at the end of the 1750s. The most prominent feature of this room is the large oval or "bull's eye" which is the focal point of the west pediment. Perhaps of more interest on some level is the original shelving in this space- a rare survival. The shelving confirms this space was used as storage, almost certainly the "China Closet upstairs" mentioned in the 1799 inventory. 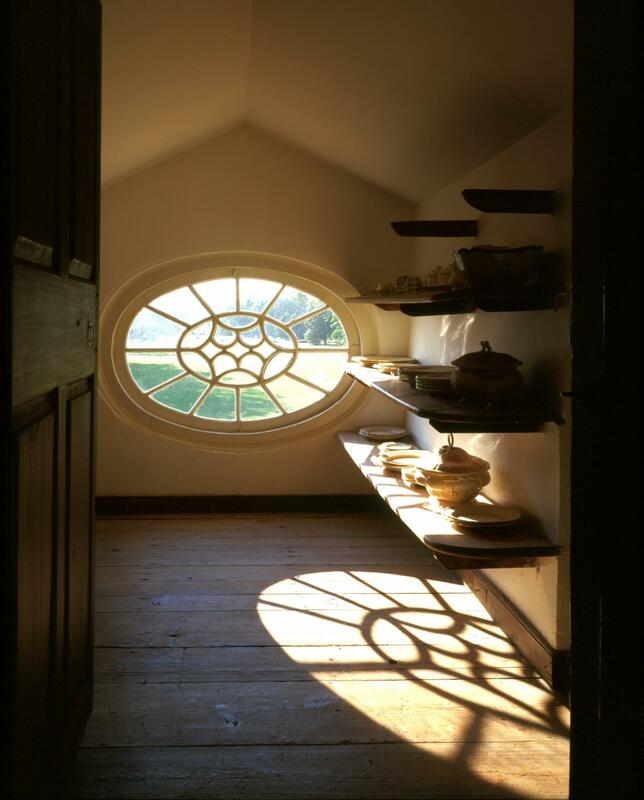 Washington added this architectural feature, generally found on public buildings, to the Mansion in part to help cool the house, as it draws hot air out through open windows. By providing a strong vertical axis, the cupola also helps disguise the asymmetry of the west facade, facing the bowling green. 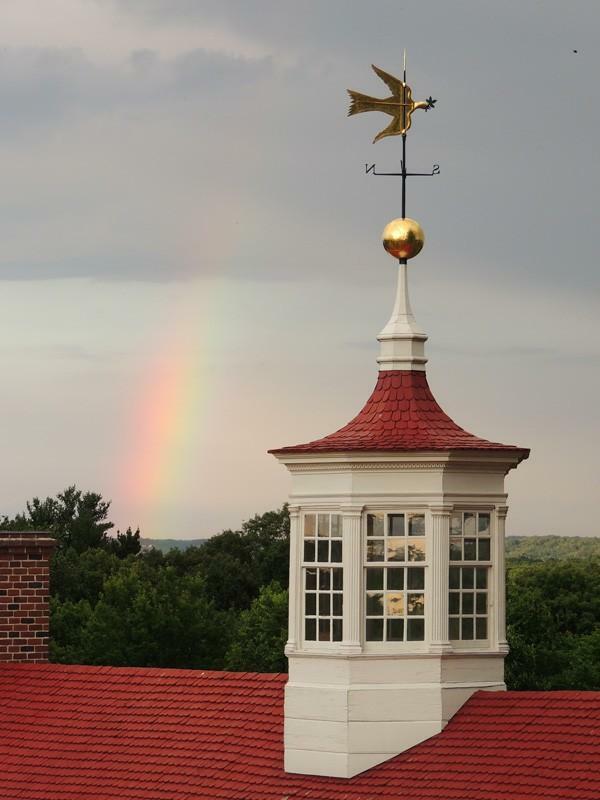 The weathervane atop the house decoratively incorporates a dove with an olive branch in its beak, symbolizing Washington's hopes for peace in the new nation. He commissioned the work from Philadelphia artisan Joseph Rakestraw while presiding at the Constitutional Convention during the spring and summer of 1787. The weathervane here is an exact replica of the original, which is preserved and on view in the Museum. Structural evidence for the changes to the Mansion can be found within the cellar.